On the upper level of the station there are two permanent works of public art as well as one site for temporary exhibition of different works of art. London has two other such locations, the fourth plinth on Trafalgar Square and the Turbine Hall in the Tate Modern. Each of the sites has its own constraints and opportunities. The St Pancras site is characterised by the need to suspend the art work from the ceiling. 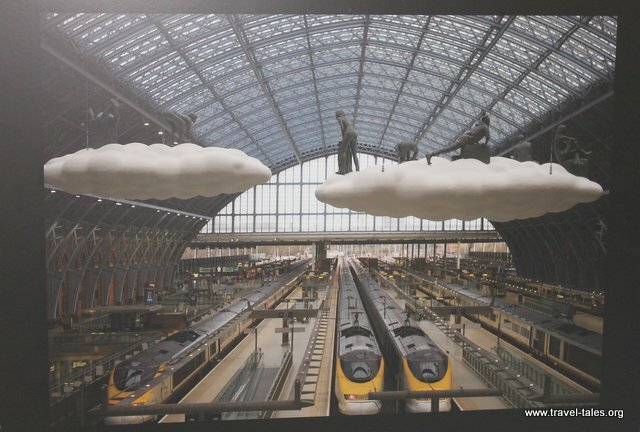 A display explaining the site and tracing its progress had this picture of the first work at St Pancras, featuring clouds and travellers suspended above the platforms. The current temporary work of art is ‘One more Time’; an inverse of the Dent clock which permanently looks over the platforms. Depending on where you are on the station it can eclipse the permanent white clock. The artist Cornelia Parker is inviting a meditation on the passage of time, life and mortality. “The clock is the most conscious focus of a railway station. Everyone is watching clock, checking if they are late. The piece will introduce a parallel time reference, that of a slower, astronomical time.” It reminded me of shifting time, its permanence as well as how our perspective affects its perception.